Known as our most easily spotted staff member, Oliver stands at 6’7” and joins Sail Caribbean for his third year. Oliver calls Denver, CO home and graduated Kenyon College in Ohio in 2010 with a degree in biology with a focus on ecology and evolution. He now works at Brunswick High School in Greenwich, CT, teaching biology, marine biology, and biology of human health. There, he also coaches the football team and sailing team, which won states, New England regionals, placed seventh in the nation all in fleet racing. Having started sailing when he was 11, he grew up working at a summer camp since he was 12 teaching sailing. After college, he ran a sailing company in the Middle East from 2010 to 2012, where he even taught sailing in French! In 2011, he sailed a tall ship from Singapore to Bali, in order to deliver it to the research team he would then join to study coral reefs for the next three months. If all this isn’t impressive enough, he is also one of Sail Caribbean’s most enthusiastic turtle taggers. 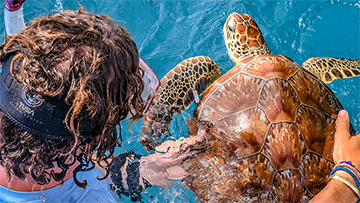 On the Foxtrot and Sierra programs, he and his students work with the Conservation of Wildlife and Fisheries to catch, measure, and tag sea turtles species to contribute to the conservation effort. Outside of Sail Caribbean, he loves to fly-fish, hike, go to museums, and travel, having spent significant time in 27 countries now! His most recent proud moment is getting ordained in order to marry his sister on Earth Day. Alex grew up in Raleigh, NC but more recently has been living in San Diego, CA where she will be returning to following the season to start attending the University of San Diego for a Masters in Education. Since graduating from the University of North Carolina Wilmington in 2010, Alex has been lucky enough to see some of the world by boat. She has worked as a marine biologist aboard a dive boat in Australia, sailed around the islands of Papua New Guinea and worked as a stewardess and deckhand on a super yacht in the Bahamas. Since 2014, she has been working at a year round marine science camp in San Diego. Returning to Sail Caribbean for her second year, Alex loves getting to work with the students and making a difference in their lives. Her favorite memories are days spent at the Bitter End Yacht Club, getting to hang out with the kids, doing water sports and sailing Hobie cats. Outside of Sail Caribbean, Alex loves teaching and marine biology, and enjoys hiking with her dog, a Sheltie named Mason, hot yoga, and being with her family. Originally from Haslemere, UK, Will currently lives at school, Southampton University, where he is in his second year of a Master’s degree in Marine Biology and also a First Team hockey player. Marine Biology was always his favorite subject, so when he was 17, he had an internship at a Marine Research fish farm which influenced him towards a career in the field. Will grew up always spending summers on the water, constantly doing water sports, fishing and kayaking. He got his open water certification when he was 12, and became a dive master in Figi when he was 18. He then went on to teach as a dive master in Figi and Zanzibar and achieved his instructor certification while he was with us last year. 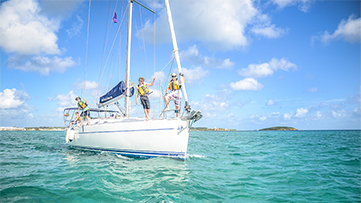 Will believes the best thing about Sail Caribbean is the opportunities it gives kids. His favorite part of his job is that it is doing what he loves, sailing and scuba diving. Outside of Sail Caribbean, he enjoys cycling, skiing, and travel. Will won University First Team MVP last season for his hockey team. Born and raised in California, Jen is most at home when close to the sea. Returning for her third year with us, Jen graduated from Williams College in 2013 with a degree in psychology, and also played Varsity basketball and volleyball. She attended as a student in 2011, and has since proven herself in every position from Mate to Program Director. The Echo program made her fall in love with sailing and living on a boat, where a contained community uses teamwork and contribution to make everything happen. Jen is very interested in outdoor education and has lived in Ireland working for an adventure center where there was tons of activities such as surf lessons and ropes courses. 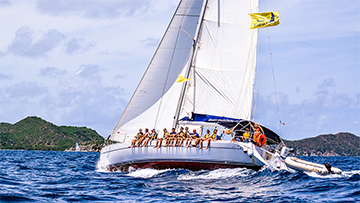 Recently, she has spent the last eight months in the Sail Caribbean New York office, working on redeveloping programs, recruitment and behinds the scenes matters in hopes to make this season the best it can be. Ish is returning for his third summer with us. He originates from King of Prussia, PA, but since graduating from Prescott College in AZ with a degree in psychology and adventure education earlier this year, he considers himself a bit of a nomad with a future of travel adventures in mind. How does one get a nickname like Ish? Interesting enough, on his university’s freshmen orientation backpacking trip, his crew compared his smile to that of the Cheshire cat from Alice in Wonderland, which ultimately got distorted and shortened to Ish, his now acknowledged name. 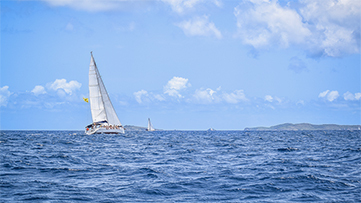 Although coming to us with little sailing experience, his sailing aptitude and skills were quickly solidified through all the training and experience Sail Caribbean allows. 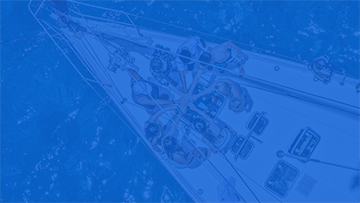 Ish truly resonates with Sail Caribbean’s objective to help people build, develop, and grow, all within a community that has a love for the ocean and the natural world. It also doesn’t hurt that his job allows him to jump in the ocean every day before breakfast. Ish will never forget snorkeling the outer reef at Anegada a few years back, swimming among sharks and eagle rays. Outside of Sail Caribbean, Ish enjoys music, playing guitar, surfing, rock climbing, backpacking, skiing, and eating, preferably some delicious corn beef. Following this season, Ish will be going on a lengthy sailing trip, from Southern California to Hawaii to Hong Kong to Australia! It’s no wonder Grace has always been a marine biology fanatic, having grown up around the bay of Baltimore, MD all her life. She currently lives in Boston, while she attends North Eastern University studying marine biology and environmental studies and also is on the marine biology Eboard, a part of the outdoors club, and working in an ecology lab. All throughout high school and breaks between semesters at college, Grace has now spent over 200 hours volunteering at the National Aquarium in Baltimore as an exhibit guide and a part of the animal rescue program, rehabilitating sea turtles and seals to release them back into the wild. 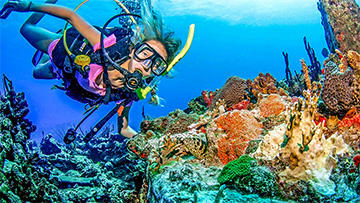 When participating in the Sierra program as a student in 2013, she also got her scuba certification. Grace is passionate about bringing awareness to the impact that humans have on marine life and the ocean, especially turning those that are negative into positives. She is thrilled to participate with Sail Caribbean to encourage kids to get excited about marine biology and care about the ocean as much as she does. Grace has never been so excited than when she saw sharks, her favorite animal, for the first time during staff training this year. 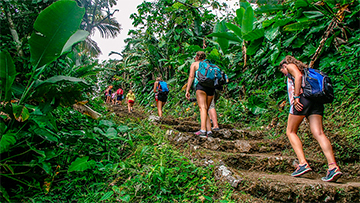 When she is not at Sail Caribbean, she enjoys backpacking, music, playing guitar and ukulele, and trail running. Joining Sail Caribbean for the first time, Liz is taking a break from the bitter cold of Alaska, where she has been working for a company contracted by NOAA fisheries, collecting data. Growing up in Revere, MA, she graduated from University of New Hampshire in 2013 with a degree in marine biology and English literature, where she was also a member of the sailing team. Liz grew up in a yacht club that her parents belonged to, and then participated in a sailing program that her parents started when she was 8. Liz is most fond of her work of seven years at a nonprofit sailing organization for inner city teens. Now, at Sail Caribbean, she is really fond of the independence and trust bestowed upon the kids. Her other interests include reading, writing, and travel. Her travels have even gotten her accidentally up close and personal free diving with a great white shark! Eliot joins us from Bethesda, MD, but is currently attending school at Haverford College in PA. He studies Political Science with a minor in Chinese language. Starting in 2007, Eliot spent five years enrolled as a student of the program. He enjoyed the friends he made who kept returning each summer. The Sail Caribbean program really attracted Eliot due to his interest in marine biology from a young age. After participating in a bubble maker program on St. Thomas, he knew he wanted to pursue a life underwater. Following his time as an SC student, Eliot then completed the Sail Caribbean Dive Master Internship and is a member of Sail Caribbean’s staff this year as a Dive Master and mate. Always ready with a funny one-liner, Eliot loves diving at the Fearless and the Indians or sailing to his favorite location of Little Harbor on Peter Island. He will never forget hanging out at the Baths with his core crew of friends who always returned for a summer with Sail Caribbean. When Eliot is not at Sail Caribbean, he plays tennis on the Haverford Varsity Tennis team and plans to study abroad next year in Beijing and Germany. Joining us for her second year all the way from Dublin, Ireland, KB is known as one of the funniest people in our entire program. She graduated from University College of Dublin in 2014, earning a degree in zoology and also acting as the captain of the windsurfing club. From age 10 to 17, KB was a member of sea scouts, where she was actively sailing, rowing, kayaking, camping, and hiking. Since being involved with Sail Caribbean, KB loves that its students and staff all have the same mind set. She says, “Everyone is outdoorsy and adventurous, so they agree on a common goal, all while having loads of fun.” She loves to learn about the students, and see where they’re from because they all come from such interesting backgrounds. 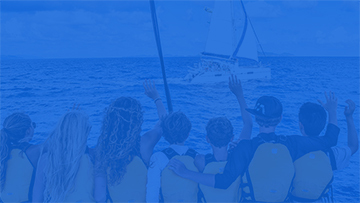 She’ll never forget her favorite Sail Caribbean memory last year, when her boat med-anchored out of Little Harbor, and as the sun was setting, her and her kids took their turns jumping off their boats in complete delight. Bubbly, kind KB is never shy to admit her best friend is her Great Dane and Shepherd mix, Zeus!